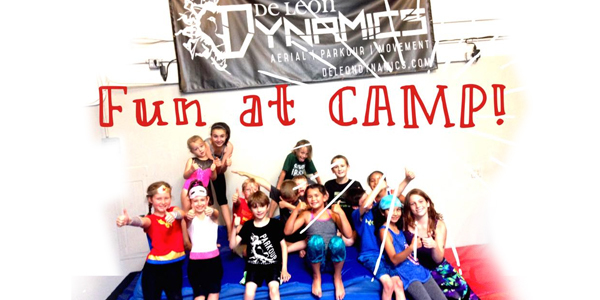 Join us during your school breaks for tons of fun at De Leon Dynamics’ Camps! Visit our CAMP SIGN UP PAGE! Spring Break Camp (April 15-19) and Summer Camps (all summer long!) are open for registration! Our camps feature instruction in your child’s choice of aerial (aerial silks, aerial hammock, lyra, trapeze), cirque (rolla bolla, juggling, tumbling, gymnastics), PARKOUR! and Ninja Warrior training. Times: They run 9:00am-3:00pm each day. Drop off is 8:45-9:00am (please do not drop off before 8:45am). Late pick up is available for $10/30 minutes. Have more than one? Get a 10% sibling discount!